Hello, everyone. Here we go again, huge updates throughout March which have completely transformed (yet again) just about everything. After some feedback things are going to be a little different here from now on too with these update posts to try make changes as clear as possible rather than a series of dull ramblings. tl;dr: New unlimited time free trial plan, New Site Privacy options, Single-Sign-On, New Shortcode for displaying Out of Stock products, Bug fixes, Tweaks & Improvements. I teased on Twitter earlier in the month about a change to the 7-day free trial we’ve offered up until now, and made our first official announcement post outside these monthly update posts to reveal the changes in the service which will affect everybody (for the better). Since then a few more pieces have fallen into place so I’m going to explain things in a little more detail. Why the change? Well if you read back through some of the previous monthly update posts you’ll see we’ve been suffering persistent issues surrounding the site subscription system and the whole signup process for quite a while now, the main issues seemingly being caused the 7 day trial. Sometimes subscriptions wouldn’t update on the platform after being paid upon reaching the end of the trial. After a lot of deep thought, the logical solution to all these problems was to remove the time limitation of the trial and turn it into its own plan – which when you think about it benefits everybody and just makes sense. Also thanks to the new “Free Trial” level, sites previously on a paid plan where the site subscription was cancelled and expired will now revert to the Free Trial level instead of having all access revoked until another subscription is started. Continuing on from changing the 7-day free trial into it’s own unlimited-time free trial plan, a lot of the structure had to be tweaked so that bad actors couldn’t take advantage of the offer and try and operate a site on the trial with no intentions of ever upgrading or paying for the services – which is inevitable in this line of work. While I’d love to be able to provide everybody with a fully featured functioning website for free, unfortunately I need to eat and pay bills just like everybody else. The solution to this problem was to lock down free trial sites so they can only be viewed by logged-in Administrators – and this change has now been successfully implemented. 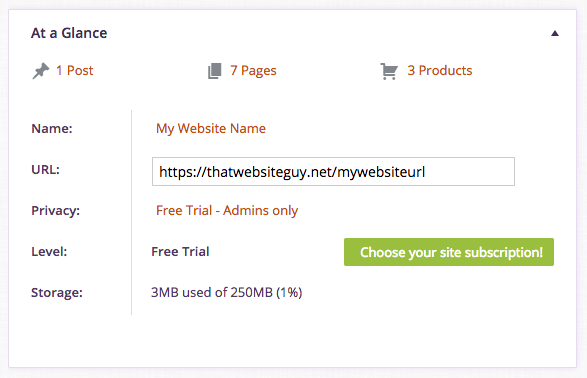 To make your site visible to the public, free trial sites will need to be upgraded to one of the subscription plans (Basic, Pro, or Ultimate). Something that comes up from time to time in the support channels is “How do I restrict access to my entire website?” for maintenance or whatever reason, and up until now the only solution has been to individually mark pages as either Private so only logged in users could see the content or Password Protected so anybody with a password could access it – neither of which is particularly ideal in these cases. For this reason I decided to extend on the new free trial’s restriction function to create additional privacy options which can be applied to entire sites so that administrators can now more easily lock down access to logged-in users or password protect their site with the click of a button. You’ll find these new options in your site’s admin panel under the Reading tab in your Website Settings. One thing that’s been a bit of a pain for me managing the platform is having to login to each site individually when handling support or if I need to make changes across every site. 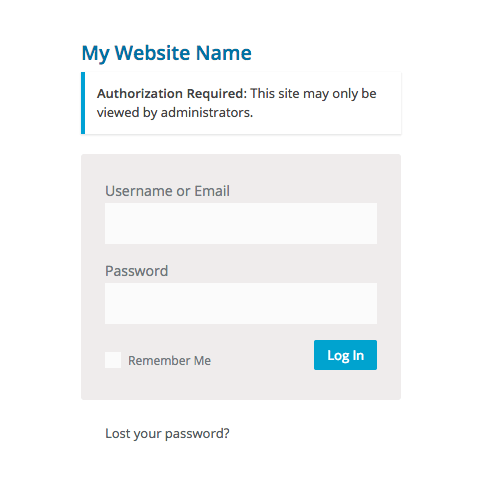 It’s not just me that this affects either – those of you who login to thatwebsiteguy.net to access your site admin panel or manage your site subscription have also had to re-login with the same account details. A new feature is being trialled which enables Single-Sign-On across all sites on the platform, meaning you should now only need to login once and your session will carry over between sites. I should stress that this is a new feature and is still in the process of being fine-tuned, and if any significant issues pop up it will likely lead to the feature being disabled if they can’t be fixed. If anybody does notice anything strange going on, please do reach out through the usual support channels. One of my support requests in March was “How do I add a page listing all my Out of Stock products?“. An easy task I thought, so I pulled up their site, switched on the Page Builder, and dragged the Ecommerce module onto the page, only to discover that there’s not actually a filter for Out of Stock products. Of course one work-around would have been to simply create a category for Out of Stock products, and then add Out of Stock products to that category and have the category displayed on a page, but that seems like too much work for a store-owner, especially for busy stores where products often come in and out of stock. So I decided to develop a new function for it instead. You can now display products marked Out of Stock on a page using the new shortcode – [out_of_stock_products]. I’ll be working to also include a filter for Out of Stock products in the Ecommerce module of the Page Builder in the future. Along with the new free trial plan fixing a long-standing issue with site subscriptions, a minor bug was discovered with the admin bar’s Log Out link redirecting to a 404 page which has now been fixed. Another issue was discovered with the Affiliate Program after the most recent changes with site subscriptions which has now also been fixed. Now for the more insignificant bits. A lot of things were tweaked and improved throughout March. Much of my focus was on SEO and also refining some smaller details which had been overlooked up until now. With the new site privacy options the Admin dashboard’s At a Glance section now shows the current privacy level. With the launch of the CoinPayments Integration app last month, the CoinPayments logo has been added to the dashboard’s Tools & Resources section. The nameservers in the instructions on the Domain settings page have been updated. The admin bar across the top of the admin panel now shows the name of the current site – which is helpful for customers with multiple sites to keep track of which site they’re currently editing. The site subscription link text in the admin bar has also been tweaked for clarity. Help text has been added to the support dashboard’s create a ticket page along with a link to the knowledge base. A ticket category has also been created for Affiliate Program support. Sites on the free trial level will see a notification message in their admin panel informing them the site is only accessible to admins until a plan is chosen. The Performance app’s HTML code output has been cleaned up, and the Checkout Addons app settings have been reworded for consistency. Help articles have been added to the knowledge base for the Catalog Visibility & Checkout Addons apps. Some comments in the HTML code output have been cleaned up, and the site’s tagline has been added to the logo image’s alt tag for SEO. The Showcase now knows which sites are using SSL and correctly links to https:// on SSL enabled sites. The My Account dashboard My Sites list now shows sites with their custom domains and also correctly links to https:// on SSL enabled sites. Each site now also displays it’s current subscription level name, and the “Create a site” link no longer opens in a new window. The sidebar menu on the My Account dashboard has been re-ordered and now includes a link to the Site Subscription page, and this menu has also been reflected in the website’s main menu in the header. The Affiliate dashboard has had a little makeover and a few styling issues have been fixed. The Support dashboard has also had some help text added along with a link to the knowledge base. One of the support requests in March was from a customer having trouble renewing his site subscription using a new card. After a lot of troubleshooting we finally figured out that he had been entering his new card info on the Site Subscription page whilst also entering his account password in the field above the new card form to use his original saved card – so the payment gateway tried charging his old saved card. Because of this some help text has been added to the saved card section to make this clearer. Anybody keeping tabs may have noticed the homepage has had a little bit of a redesign in an attempt to give more info about the platform and look more appealing. The main reason behind this was to try gain some more traffic from search engines, and I’ll continue to make tweaks to try and get the most out of it. A login link has also been added to the top section of the homepage for existing customers to quickly access their accounts. The site has also had a significant speed boost after more performance optimisations. That’s everything for March – until next month!